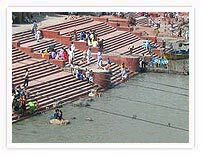 Legend has it that sage Bhagirath performed penance for several centuries before the goddess Ganga agreed to descend from her heavenly abode to wash over the bodies of his ancestors. He then did penance for another few centuries to persuade Lord Shiva to contain Ganga's power, because the force of her water would split the earth in two. Eventually, Ganga did descend and Bhagirath's ancestors went to heaven. The river, therefore, is called the Bhagirathi until it joins the Alakananda to become the Ganges. On this trek, you follow this river to its source and beyond. The high altitude pasture called Tapovan, the wonderful Nandanvan and the high altitude lake at the foot of Basuki Parbat await you. Shivling, the Bhagirathis, Sundershan and Meru are some of the peaks encountered on the trail. Depart Rishikesh on the drive to Uttarakashi. You get some wonderful views of the high mountains. Overnight at a simple tourist bungalow at Uttarakashi. Drive from Uttarakashi to Gangotri. Stop en route at the hot springs at Gangnani where you can have a hot bath in the pools, then proceed to Lanka. On this exceptional drive, you get some good views of the Bhagirathi. Continue up several hairpin bends to Sukki, from where the entire valley opens out in front of you. The river bed is wide and several comparatively lazy meandering streams flow down it into a narrow gorge. 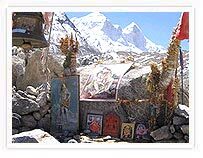 Camp is set at Gangotri, with its Ganga temple. 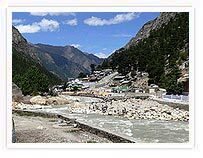 Gangotri is an inhabited valley during the summer months, surrounded by slopes covered with deodar and fir trees. Above these slopes are the dramatic rock walls. Start with an easy day walk and follow a well defined trail to the famous pilgrim route to the sources of the Ganges. Walk through the forest out into unforested hillside and then back into pine forests to Chirbasa where camp is set for the night. Leaving the trees behind, trek towards Gomukh. Just before Gomukh, is a group of birch trees near Bhojbasa. Just beyond are the green fields of Tapovan. Overnight camping at Gomukh. Visit Gomukh (Cow's mouth"). This is where the sacred Ganges originates. Then carry on past the boulder strewn glacier on to the green fields of Tapovan where you set camp for the night. Retrace your steps from Tapovan along the glacier till you are almost across it. Then proceed upstream along its true right moraine and cross both the Raktwarn and Chaturangi glaciers. Climb the true left moraine of the latter and find yourself in Nandanwan. From here, over half a dozen mountains of over 18,000 feet (6,000 m) can be seen. Overnight camping. Start trekking upstream in the Chaturangi glacier with the Bhagirathi Parbat massive to your right, cross the glacier between the massif and the Vasuki Parbat and come to a beautiful lake at the foot of the Parbat. Overnight camping. Continue the trek on to Gangotri where you camp for the night. Vehicles await at Gangotri for the drive to Uttarakashi. Overnight in a simple tourist bungalow. Continue the drive to Rishikesh, where the trek ends. From here you can go to Delhi by road or train.